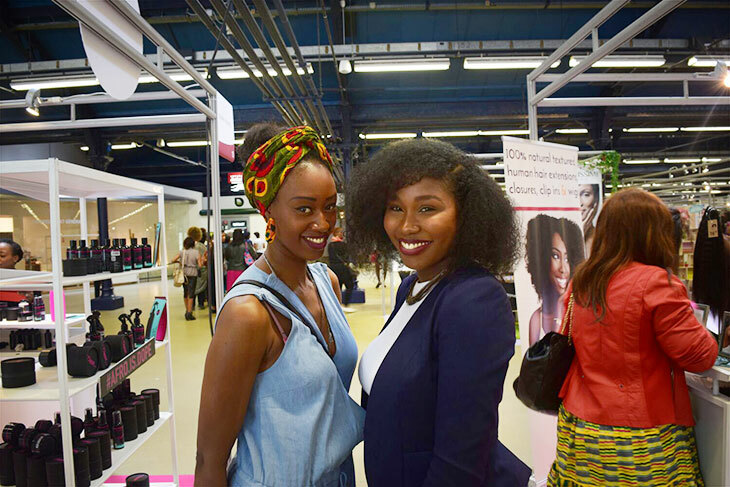 Hundreds of African women from across the diaspora came together for the Natural Hair Academy in Paris. 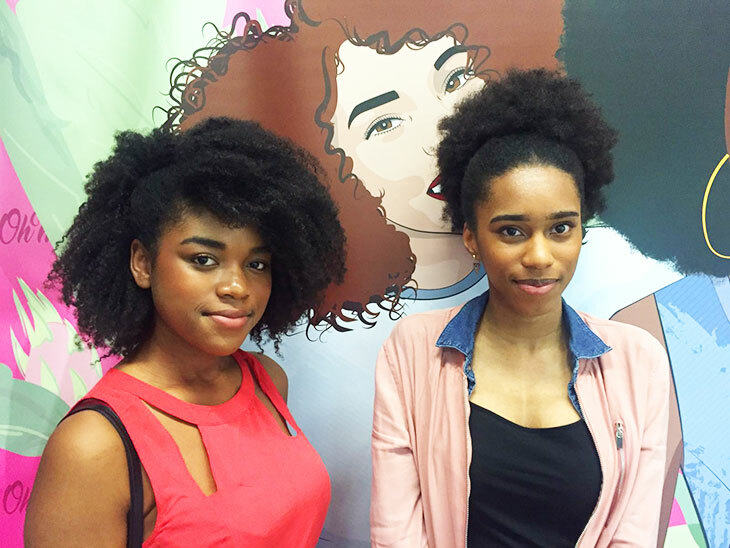 We asked them about their hairstyle and what going natural means to them. Ophélie (right) and Lisiane (left). Lisiane is 19 years old and from Cameroon. We’ve got a YouTube channel named TalkWithLylie, I wanted to discover brands which we can’t really find in France and mainly to see diversity. When you’re in Paris you don’t really see people with huge hair so it’s a really pleasure to see all these people like us. We’re not alone ha ha. For how long have you been natural? It’s been a year and a half since I’ve been really taking care of my hair. But I’ve been natural for ten years. Today I just got a wash and go, with a little bit of a Shea Moisture leave-in gel. Then I did ten braids before before going to sleep. And I woke up like this! Flawless! How has having natural hair affected your life? I feel like I accept myself so much more. Even if my hair is dry I don’t care ! It’s me. I just go out! Before I really couldn’t do that, I didn’t like my hair at all. I get so many compliments at school, people asking me if my hair are real etc. If you had one hair product to take with you on a desert island, what would it be? Who’s your natural hair idol? Shima Edward, she has a huuuuge Afro and I want the same. Ophélie is 19 years old from Guadeloupe. Same for me, it’s for products and beautiful big hair. For three years because I was asking myself why I was putting chemical products in my hair… I had a lot of dandruff and didn’t understand why. Yes! Definitely ! When you’re out with an Afro everybody looks at you, you receive a lot of compliments at events. In the underground people talk to me about my hair etc. I just can’t take people asking to touch my hair anymore though. If you could only take one hair product with you to a desert island, what would it be? Curlidole, she is the one I started to look at when I went back to natural hair. I love her hair and she is so funny. She’s got good techniques. She taught me to flat braid and more. Wendy Lopes is from Cape Verde. 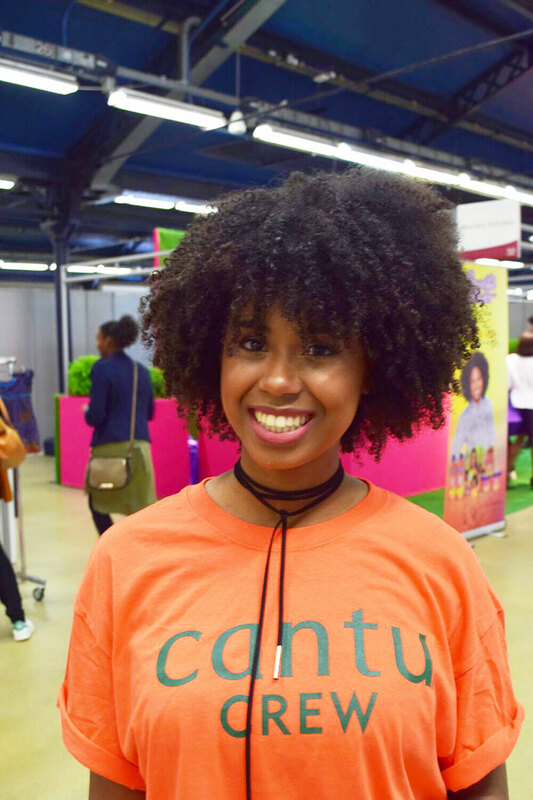 I’m here to represent the brand Cantu. So what’s your hairstyle today? Just a wash and go. Kathy is 27 years old and from the West Indies. Kathy: It’s my first time here. I’m here mainly to buy products that we can’t really find in shops in France and to finally see what everybody is talking about. I’ve never relaxed my hair. Being natural have always been something positive in my life. I receive a lot of compliments about my hair… some people sometimes think it’s fake which I think is weird. I’ve never had any ‘problem’ with my hair except at my job. I’m chief hostess for an event in Paris and my agency never really let me leave my hair out… and last week also – ha ha – I heard someone who was sat behind me at the cinema saying that he couldn’t see the movie because of my big hair – ha hah. My spray with water and oil in it. 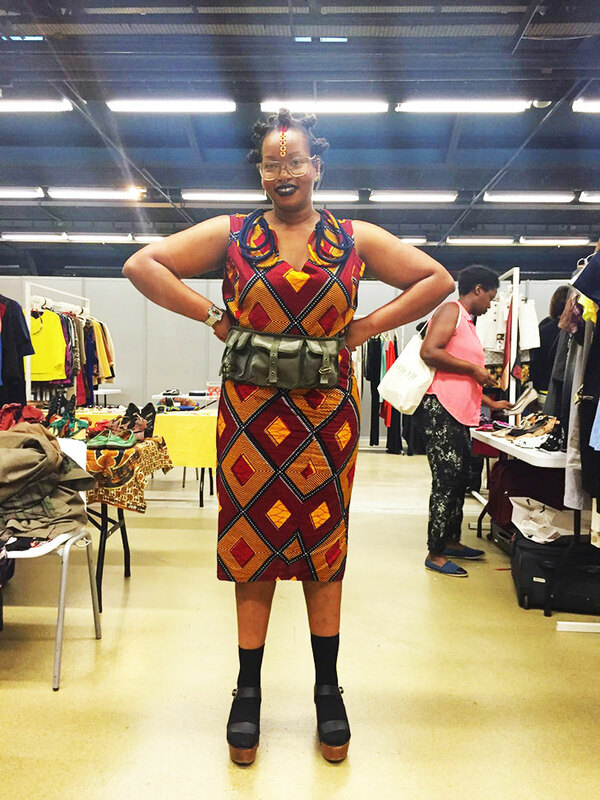 Maminetta is 31 years old and from Mali. I’m here for the love of black beauty and its amazing representation here. Finally here’s an event dedicated to us! It’s my first time here. We’ve been here for one hour and I’m already swimming in happiness. I did my big chop in December, so six months ago. Not really.. .just my job. Same as Kathy, it’s always a problem with my hair. 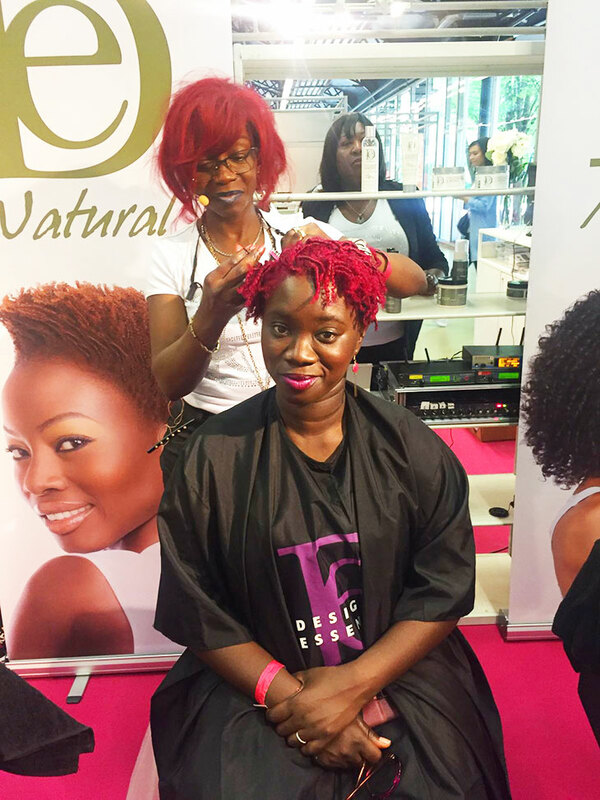 The agency don’t want me to let it out or in too ‘original’ a way which is just their way of saying they’re scared that the client won’t like it… but when I see my clients after the event they always compliment me on my natural hair. So what’s the secret to your dreadlocks? The secret to my locks is a good routine and a good diet because nutrition shows through in your hair. I take care of my hair but not to much because you shouldn’t manipulate locks too much and put too many products in it. I don’t eat too much meat, no junk food. Just eat as healthy as you can and water, water, water! Then one day my hair started falling out and that was decisive for me. It was not possible anymore for me… The problem is that when you start to put chemical products in your hair, it keeps needing them and that is so bad. So I cut everything and started my locks and I don’t regret anything. It’s been eight years since I got them. Have you experienced any bad reactions towards your hair? I’ve never had any bad reactions. I did my locks a year before going to live in the UK. People are so much more open minded there so no, I’ve never had anyone look at me or anything. My conditioning spray with my secret recipe in it. Ha ha – I won’t tell you what it is. Natural Hair Academy told us that they have a clothing exchange. My friend and I, we have so many clothes that we don’t need anymore so we decided to come here to sell our stuff. 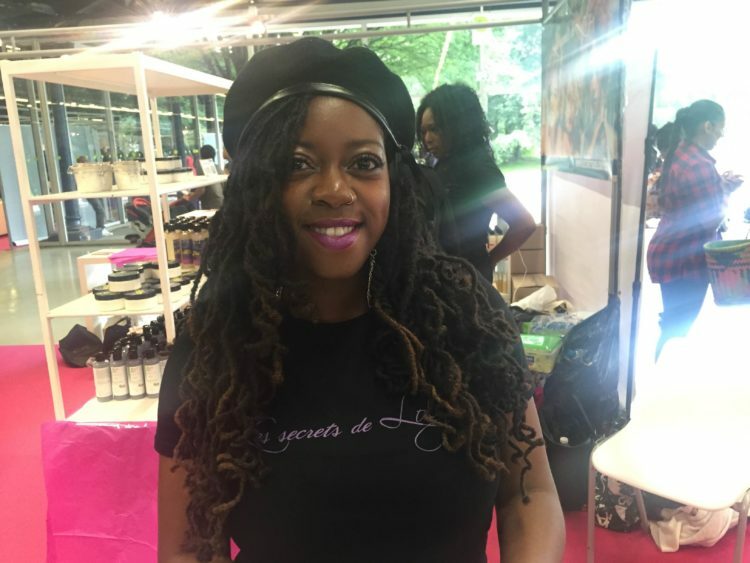 And NHA is not only about hair; it’s also about fashion and self esteem as black women and about good diets so I wanted to see a few talks about that. I’ve been natural for a long time. It came instinctively. In 2001, I had shaved hair like a boy for four years but then I wanted to have a real haircut so I grew it out and I didn’t relaxed it again. To me it’s not because you have a weave etc that you’re not natural. Being natural is just taking care of your own hair, keeping it healthy etc. Tell us about your style today. I’ve got bantu knots on my head, a really old African hairstyle. My personal touch is this gold jewellery because I’m Mauritanian. In West Africa, women wear a lot of this kind of jewellery to perfect their beauty and its often young married women who wear it. I’m wearing a dress which has been made specially for me by Gaby from Ebony City. The dress is called Aissé, like me. 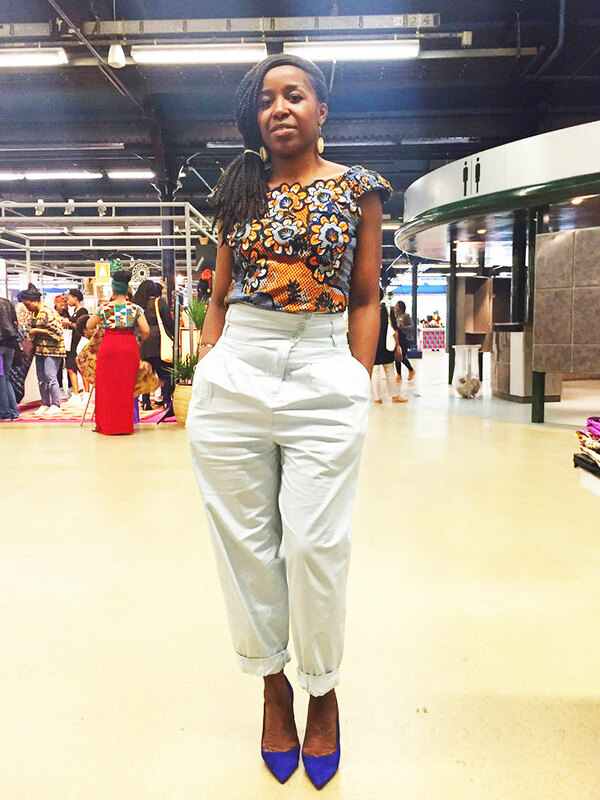 Bintou is 34 years old and from Senegal. IYEVA is doing my hair now, yesterday she finger coils my hair and she dyed my hair in pink. I’ve been natural for five years and a half but it’s been about ten years since I stopped relaxing my hair. I used to wear a lot of weave and braids. Now I only braid my hair once to twice a year mainly in winter to protect it. But I enjoying as much as I can my Afro. I’ve cut my hair not a long time ago ‘cause I just had to much and it was to much maintenance and now it’s perfect ! 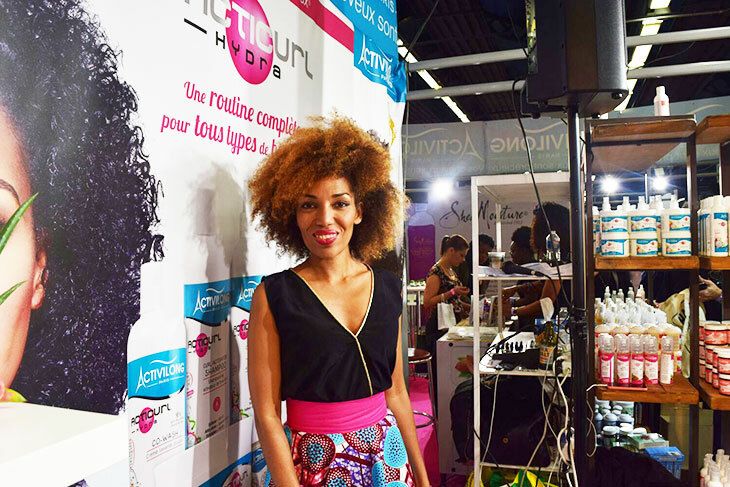 Fatou N’diaye, for her beauty, her style and her hair. For hair dyes, Asproy inspired me a lot. She is from the US and she always dyes her hair and she also inspired me to get my tapered cut. I think she will be here today. Yeah… unfortunately it’s hard to find a lot of information but I find everything on her blog. Ayden is 30 years old and from the West Indies. I’m here to animate the Activilong corner and I’m also the CEO of Glam Ethnik. I have been natural for four years now. Did it change something in your life? Being natural is my identity, my energy, and it’s a part of my job! I also work on TV, as a presenter and I’m known as ‘the girl with the big hair’ so it is a big part of who I am.